Several Halloween denizens are pumpkin-headed monsters with faces carved into them. This is most commonly used for the Headless Horseman, but a Jack-o'-Lantern man is very common. There are two types of Pumpkin Person. One type simply wears a mask of a Jack-o'-Lantern, while the other's head actually is a pumpkin. A lot of the time, the person's name actually is Jack. This trope has relation to Scary Scarecrows, who often have gourd heads, and Stingy Jack, who, of course, started the Jack-o'-Lantern. Often a Plant Person. Sub-Trope of Non-Human Head. Compare/contrast Skull for a Head. This trope does not refer to Billy Corgan, James Iha, D'arcy Wretzky, or Jimmy Chamberlin. Naturally, Lord Pumpkin, one of the most notorious villains in the The Ultraverse. 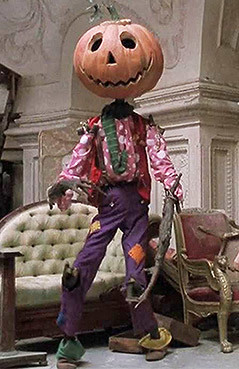 Merv Pumpkinhead, the Dreaming's janitor in The Sandman, is an animated pumpkin-headed scarecrow. He's rather a Captain Ersatz for Oz's Jack Pumpkinhead. Hack/Slash has Samhain, a potentially-redeemable slasher with a Halloween theme who wears a pumpkin-like mask. D-list Spider-Man rogue Jack O'Lantern. Who's mostly D list because he's a Legacy Character of non-importance, and yet another one of Spider-Man's rogues on a glider who throws pumpkin based weaponry aside from the two famous Green Goblin and Hobgoblin. The most notorious Jack O'Lantern actually took over the Hobgoblin mantle for a while, before being killed off by the original for besmirching the name. In The Nightmare Before Christmas, Jack Skellington has a pumpkin on his head in his Pumpkin King costume. In The Adventures of Ichabod and Mr. Toad, the Sleepy Hollow segment portrays the Headless Horseman with a jack-o-lantern in place of his head. A Pumpkin Person makes an appearance in Goosebumps, a reference to the book "Attack of the Jack-O' Lanterns". Sam, from Trick 'r Treat has a pumpkin-like head under his mask. Notably, the face also shares some features with a skull. In Halloween III: Season of the Witch one of the Silver Shamrock masks is a pumpkin. Actually averted in the horror movie Pumpkinhead. The eponymous monster is saddled with a Non-Indicative Name, and is more of a Xenomorph Xerox. The Marvelous Land of Oz has a rare non-evil version with Jack Pumpkinhead, who shows up in several of the later Oz books (eventually getting one named after him  ), as well as appearing as a character in Return to Oz. He is basically a wooden scarecrow brought to life by a magic powder. His pumpkin heads eventually rot, so he keeps a pumpkin patch to replenish them, and Ozma carves him a new face. The old heads are buried in a graveyard at his house. The Headless Horseman from The Legend of Sleepy Hollow is sometimes depicted with a jack-o-lantern in place of his head. Pumpkin Pete from Sidekicks by Dan Danko is a pumpkin-headed superhero who claims to have "all the powers of a pumpkin." Apparently, pumpkins are good runners. The French/Belgian Puppet Show Telechat has a Show Within a Show called "Leguman ", a cheesy on purpose parody of Sentai series like Choudenshi Bioman. The titular character is made of several vegetables including a pumpkin for a head. RuneQuest. The Jack O'Bear is a hairy bear-like monster with an orange head that looks like a pumpkin. Original D&D Supplement 1 Greyhawk. At the end of the book is an illustration of a bugbear monster that shows it with the head that looks like a carved jack-O'-lantern. The 1st Edition Advanced D&D supplement Fiend Folio introduced the scarecrow monster, which was a humanoid made of sticks with a carved jack-o'-lantern for a head. Pathfinder: Leshys are a type of small, plant-based humanoids artificially created by using various types of plant as bases. One variety is gourd leshys, which are grown from pumpkins and have a carved one for a head. The carved part is not an inherent part of their anatomy — their gourds are solid while the body is being grown, and need to be carved so that the leshy will be able to see and speak. Playmobil Figures Series 3 features a pumpkin-headed scarecrow. Living Dead Dolls Pumpkin and the Headless Horseman apply. The former is a slasher-type hooligan with pumpkin face paint, and the latter has a pumpkin-shaped head which can be removed. The Grossery Gang has Space Jump Pumpkin, an evil cyborg pumpkin. He has vines for his non-mechanized limbs, and his face is made out of carvings, which are leaking his pumpkin guts. Warframe has a seasonal "Dullahan Mask" cosmetic that replaces the head of a Warframe equipped with it with a Jack O' Lantern. Pumpkins can be worn as helmets, giving the appearance of this trope. While they obscure vision and don't protect from damage, they can prevent an enderman from becoming hostile and keep undead mobs from burning in sunlight. Snow Golems also wear pumpkins. The Jackolyte item from Destiny makes the guardians who use it an example of this trope. In Borderlands 2, the Halloween Episode DLC TK Baha's Bloody Harvest allowed the players to collect and wear pumpkin head swaps for all six vault hunters. The Halloween update for Five Nights at Freddy's 4 includes Jack-O Bonnie and Jack-O Chica, who may be examples of this as an Exaggerated Trope, as they are completely made of pumpkins. Team Fortress 2 has the Horseless Headless Horsemann, a skeleton with a Jack-O' Lantern for a head. The mercenaries can also achieve this trope with the Horseless Headless Horsemann's Head, won by beating the HHH. One of these appears in JustDance 2's DLC Profesor Pumplestickle. It Reappears for "This is Halloween" in 4. Jack-O-Goombas from Super Mario Galaxy and its sequel are Goombas that wear Jack-O-Lantern masks, which protect them from being stomped on. A spin will smash the mask, and a Ground Pound will take out the mask and Goomba. In Sonic Adventure 2, you can give Chaos pumpkins to wear on their heads. Splunkins are from New Super Mario Bros. and are basically waddling pumpkins that take 2 stomps to defeat. Castlevania: Lament of Innocence features the hidden character Pumpkin who is basically a burlap sack fashioned into a humanoid shape with a pumpkin for a head. He fights much like Leon, only with a different (permanent) special weapon. Pumpkin carries over into Castlevania: Curse of Darkness as one of the Innocent Devils. He's the hardest one to craft due to requiring a special weapon to do so. The Headless Horseman , an enemy in the Pumpkin Moon event who appears riding a black horse and wearing a pumpkin as a head. It has a chance to drop a Jack-O-Lantern mask, so that you can wear a pumpkin in your head too. There's also Pumpking , one of the two mini-bosses during the Pumpkin Moon event. He appears as a giant, floating wraith wearing only a cloak and a pumpkin as his head, that rotates alternating among three different faces. EarthBound has the Trick or Trick Kid , an humanoid enemy wearing a pumpkin who appears in Threed during the Zombie Apocalypse. Medievil 2 has various pumpkin-based hazards in the Kew Gardens level, such as giant pumpkins that roll around the landscape trying to crush Dan, ordinary-sized ones that bounce around and explode on contact, and pumpkin men that reproduce by implanting their seeds into the level's inhabitants. A giant pumpkin-shaped robot serves as a miniboss during Shade Man's stage (which has a strong horror/Halloween theme) in Megaman 7. Mispolm, God-Beast of the Woods in Seiken Densetsu 3, takes the form of a giant jack-o-lantern sat atop a mass of roots. Pumpkinheads in the Ogre Battle series are monsters created by the experiments of Deneb the witch. The Pokémon Pumpkaboo is essentially a floating pumpkin with a shadowy cat/batlike head. It even has the ability to shine light out of the carved holes in its body. Its evolution, Gourgeist, now has a carved face on its lower body, though its head gives its body shape a more gourdlike appearance. Both apparently are created from spirits that inhabit a pumpkin. Jack, the Czar of Halloween, in Animal Crossing games wears a pumpkin on his head. As of New Leaf, your town's villagers will dress up in similar costumes on Halloween, making it a bit trickier to identify Jack. The Fir Bolg of City of Heroes have been transformed into humanoid vine monsters with pumpkin heads. In Guild Wars, Mad King Thorn's head has been replaced by a jack-o'-lantern in the Underworld, as seen during his annual reappearances in Lion's Arch and Kamadan. Recettear: An Item Shop's Tale: The Samhain boss has a pumpkin for a head. In Overwatch's Halloween event, Reaper has a skin called "Pumpkin". Squashini from Kirby's Epic Yarn is a pumpkin-headed ghost magician. The titular Pumkins from Pumkin Land are Walking Head pumpkins. Recurring Shin Megami Tensei Mascot Mook Pyro Jack has a Jack-O-Lantern head. Thebestmaster from Cucumber Quest has a dark greenish jack-o-lantern for a head. Fittingly, his modus operandi revolves around scaring people. Unfortunately, he's not very good at it. Stingy Jack from Zack Jack naturally appears as a disembodied, talking jack-o-lantern. Ichabod from Third Shift Society , who is also an Occult Detective. SCP Foundation: SCP-2331 ("SCRAVECROW") . SCP-2331 is a scarecrow with a pumpkin head that has a fluorescent blue glow inside it. He creates raves and acts as a DJ at them. In the Wolfenstein episode of Ross's Game Dungeon (which was released on April Fool's Day), Ross replaces the head of every NPC with a pumpkin. The opening credits of Tiny Toon Adventures Night Ghoulery has The Pumpkin Guy, a parody of Jack Skellington with a pumpkin for a head. The Grim Adventures of Billy & Mandy features Jack, a trickster who was decapitated. After a deal with Grim (Returning his scythe in exchange for immortality), Grim cut off his head. He then replaced it with a Jack-O' Lantern. Gravity Falls has the Summerween Trickster, who wears a mask with a Jack-O'-Melon type face. It's the Great Pumpkin, Charlie Brown features Charlie Brown being asked to model for a Halloween Party. By this, we mean Violet drew a Jack-O' Lantern face on the Back of his head for reference. ChalkZone features Jacko, a Jack-O' Lantern singer who falls in love with Rudy's Jill-O' Lantern, a non-living example of this trope. In The Simpsons Treehouse of Horror XIX, Milhouse brings the Grand Pumpkin to life. He then proceeds to eat at least three people as revenge for them carving and eating pumpkins. However, the Grand Pumpkin doesn't care if humans carve yellow pumpkins (apparently, pumpkin people are racist). In Scooby-Doo! and the Goblin King, Jack O'Lantern, a sentient pumpkin, is worn as the head of the Headless Horseman. He's not exactly pleased with the ordeal. In the Hiccup Hijinks episode of Rugrats, Angelica creates a "scream machine" to scare Tommy's hiccups away. The "machine" has a humanoid shape, and a Jack-O' Lantern decoration forming the head. Phineas and Ferb had a Halloween episode, "That's the Spirit! ", which featured a Pumpkin-headed monster chasing them throughout a haunted house- only the Pumpkin-head was a robot, and the haunted house was a prank being put on by the neighbors. In Over the Garden Wall our heroes stumble upon an entire village of pumpkin people! They're actually just people in pumpkin costumes who also happen to be the moving skeletons of the dead. Samhain, one of the more well known villains of The Real Ghostbusters is an evil spirit with a pumpkin head. In the Bugs Bunny short Rabbit Rampage, Bugs, as part of his torture from an off-screen animator, has his head erased and replaced by a jack-o-lantern. Bugs is not amused. Bugs: (fuming) Okay, buddy, you've had your fun. Now, what about a rabbit's head?! Bugs: Okay, you comic book Rembrandt, make with the eraser! An episode of Moville Mysteries had a Headless Horseman with a flaming pumpkin head who was able to cut other people's heads off and replace them with a Jack-O' Lantern. You're bound to see one of these on Halloween. Whether it's a costume, a decoration, or otherwise. Fun World, the company behind the Ghostface mask, make the Pumpkin Slayer costume, which come with a Pumpkin Mask, orange gloves, a fedora, and a cape. Fun World also make various cloaked pumpkin people as decorations. Notably, these are also examples of Dem Bones. Knotts Scary Farm's Trick Or Treat House features the Pumpkin Twins, a pair of kids with Jack-O' Lantern masks that the Green Witch turned into minions. Notably, the actors don't have to wear the masks over their faces. Knotts Scary Farm's Pumpkin Eater attraction features the titular Pumpkin Eater, a more foul and realistic depiction of a "pumpkin person" with twisted roots, leaves, and shelled skin. Halloween Horror Nights has hosted some pumpkin people. Countless Halloween decorations will use these, such as Spirit Halloween's Pumpkin Nester.